Gorgeous Calabay Parc Villa with Free Wi-Fi, Flat Screen TVs, Game Room, Private Pool and Spa! This beautiful villa offers you everything you need for unforgettable time. Cozy furnishing and comfortable bedding make this house so inviting. Each bedroom has a TV with cable to make your stay even more pleasant. House also has amazing game room to give you even more fun moments with your family and friends. 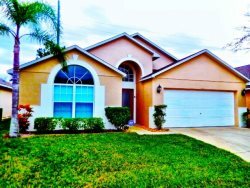 This home has beautiful lanai area with lounging chairs to enjoy beautiful Floridian weather. The swimming in the crystal clean private pool and soaking in the Spa is a perfect way to relax after long day at the parks or just to stay home and tan during the lazy sunny days. Villa is located in the Calabay Parc Community.Calabay parc vacation rental community is just minutes from some of the best shopping, popular restaurant and Parks.We are also surrounded by some of florida's finest golf courses!